Did You Visit Nourish Cafe? Let Nourish Cafe know why they're great—and if there's anything else you would like from them. May we share your email address with Nourish Cafe please? Thank you! We'll pass your feedback along to Nourish Cafe and we may just feature your comments on Kynder. Cheers! Nourish Cafe does so many things right we don't know where to begin! 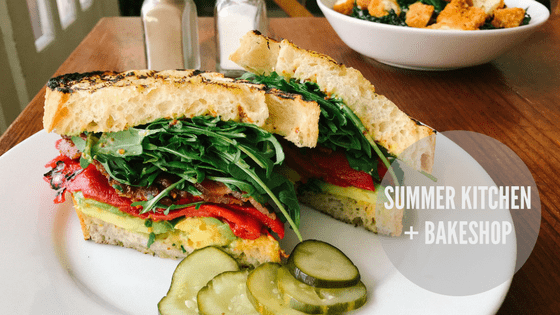 Their plant-based, colorful, creatively inspired organic menu offers something for everyone—homemade sandwiches, salads, soups, smoothies, fresh juices and smoothies and delicious baked goods, all made with locally sourced ingredients from local farms and purveyors. Maple syrup, coconut, flax and hemp seed oils, whole grains and nuts replace less healthful oils and sweeteners and giving a richness of texture and flavor. All the colors of the rainbow are represented here, beautifully served by happy staff in a delightfully welcoming space. After a meal at Nourish Cafe you'll feel satisfied, energized and virtuous all at the same time. So much goodness. Staff Benefits: Full minimum hourly wage for tipped and non-tipped staff, comprehensive training program, health care option for hourly employees, transparency in tipping for staff and guests, paid sick days (or time off in lieu) for hourly and salaried employees, fair overtime practices, fair maximum work hours, owner accessibility for staff.